Lone Rider Thailand we are a Motorcycle and Big-Bike-Owners-Friendship-Group, who´s members want to share their Love for Bikes and Riding through the Nature. As I came here first in 1997 I directly felt in love with the beautiful scenery of Thailand. In the following years I explored the whole country with different types of motorbikes and meet a lot of bikers and get in contact with many thai MCs. 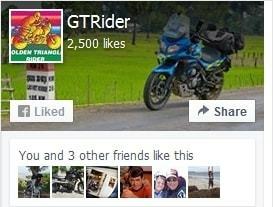 Bangkok Riders Club – Bangkok Riders Club is a loosely-structured community for motorcyclists in Thailand. It is intended for motorcycles of all makes, regardless of size or style. The concept of the Club is to exchange and accumulate various motorcycle-related information in Thailand and provide it for public reference in English language. It also aims to facilitate communication among riders. Chiangmai Bike Week North Thailand’s premiere motorcycling event. Organized by North Comets motorcycle club of Chiang Mai. Held every year during the 1st long weekend of December. Hundreds of bikers come to Chiang Mai from Singapore / Malaysia / Thailand to hang out, ride and have fun in a biker friendly atmosphere. Highside Tours Motorcycle race track in Pattaya, Thailand? Racing a sports bike in the holiday capital of the world? You hire the bike, we give you three days of track time and the chance to practice your wheelies and stoppies as well. Real Helmets the manufacturer of the highest quality helmets in Thailand. Norm’s Thai Harley Site Hello and welcome to Norm’s Thai Harley pages. I have tried to give my impression as to what it is like to ride a Harley Davidson here in Thailand on these pages. These pages are designed for Harley riders. Phuket Bike Week is an event specially held so that Thai and international bikers can get to know each other. Arguably the biggest motorcycle event in the country with thousands of bikers from all over S E Asia getting together in an excellent motorcycle community atmosphere. First held in 1995 and annually ever since from April 12 – 18 approx. M-Technik adventure motorcycling equipment. Run by Chan KP. The Singapore bike parts suppliers to the GT Riders in North Thailand. Recommended. Explore Indochina Vietnam is a frontier destination and a ride on an old school Soviet motorbike through its rugged mountains is an unparalleled adventure. Horizons Unlimited the leading RTW bikers site. The Ultimate Journey Living a Dream . . . 2 Live-N-Ride. Around the world on BMWs with Chris & Erin Ratay. An excellent site with great photos & info. Good info for touring S E Asia. Arai Japan David Unkovich uses Arai helmets. Arai make a range of excellent road and off-road helmets. Their helmets are highly recommended, being lightweight and well suited to the tropics, with a removable and washable lining. Motorcycle News Australia Good web site with latest biking info & race reports. Get your GP & SBK race info from here. Motorcycle Online The World’s Largest and Most-Read Digital Motorcycle Magazine. Moto GP official site for GP motorcycle racing, with live race / practice day info. Motorcycle News The top UK biking mags in the UK…. Performance Bike, Bike, Motorcycle News, Ride and more. Ronnie Cramer’s Motorcycle Web Index The Ultimate index to biking on the web. Whitehorse Press The motorcycle information company. You may browse through the largest selection of motorcycling books and videos available anywhere on-line or off. Moto Directory Motorcycle Touring. Lots of information to be found here. Cave Lodge run by John. Looking for the best accommodation, trekking, caving, kayaking, rafting and wild nature in north Thailand? Welcome to our site. Dave Early Good riding buddy, mate & Chiang Mai resident: On October 3, 2002, after accepting an early retirement, I moved to Thailand. I had made two previous trips after becoming fascinated with the people and culture from information garnered through Thai and Lao friends, books, and the internet. Green Discovery run by Inthy. Green Discovery Laos takes you into nature which the country has to offer in abundance, introduces you to diverse tribal peoples of the mountainous north and lets you experience the Laos ways while enjoying your favourite outdoor activities. Little Eden Guesthouse run by Phen. Little Eden, formerly T-Rex House, was established in 1997 by Rainulf Bidasak (Braasch) from Potsdam, Germany, his wife Phen and his friends Peter Höhne and Anke Ebel. Little Eden is owned and supervised by Phen Bidasak. Modenough This the website of artist & photographer Phil Bower (a GT Rider). It was created for his photographic and painted images to be viewed and sold. M-Technik adventure motorcycling equipment. Run by Chan Kok Pyng. The Singapore bike parts suppliers to the GT Riders in North Thailand. Highly recommended. Northern Trails run by Alex & Lynn. mountain biking adventures in Thailand, Laos, Cambodia, Myanmar. 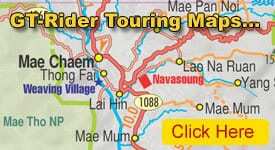 The leading organizer of Mountain-biking tours in Thailand. Siam Hammock & Tam Mi La Ghouse. Run by Watchara & Gung. Siam Hammock© is a hammock with instant mosquito net, the latest innovation of traveling kit. Tam Mi La ghouse in Chiang Khong is David Unkovich’s favourite ghouse in North Thailand. Soppong River Inn run by Burt & Joy. Soppong River Inn – Accommodation, Deck Cafe and the I-Net Sal. Siam Sun run by Danny. Siam Sun Tours is a Swiss-Thai managed tour operator established in Chiang Mai, Northern Thailand. With our experience of more than 10 years we are ready to serve you. The Boat Landing run by Joy. Award wining eco-tourism guesthouse Northern Lao. Luang Namtha Province in Laos has a lot more than you may know about…Beautiful landscapes, wonderful people, ancient cities, a nature reserve rich in biodiversity, adventure and delightful cuisine. Come and discover it for yourself! The House Of Opium. Owned by Khun Patcharee & dedicated to the deadly legacy of the opium trade, the House of Opium is a Museum that displays artifacts related to the dark periods of late 60’s when opium trade dominated the Golden Triangle. Classic Cars of Lanna / Chiang Mai Welcome to the Classic Cars of Lanna website: Classic Cars of Lanna was formed in 2005 by a group of motoring enthusiasts living in Chiang Mai, Northern Thailand. It is a friendly, informal organization of people who love old or antique cars. Silkworm Books publishers of books on S E Asia, are the publishers of David Unkovich’s motorcycle touring guide to North Thailand. Lonely Planet The world’s best travel guides. Moon Publications For 25 years, the Moon name has been synonymous with reliable and entertaining travel advice. Rough Guides Rough Guides publishes content for thousands of destinations online, taken from our most up-to-date travel guides. Mr Pumpy Welcome spoke folk! Wanna cycle Cambodia, Laos, Vietnam, Thailand, Malaysia, Indonesia and India? Worried about Asian traffic? Want some reliable road information? Then take off with Mr Pumpy and his pal Felix! Tourism Authority of Thailand The Tourism Authority of Thailand (TAT) was established on March 18, 1960, the first organization in Thailand to be responsible specifically for the promotion of tourism. Thailand The Big Picture part of the WWW Virtual Library – Asian Studies WWW server. It has been created to keep track of leading information facilities in / about Thailand. Infohub Lots of links to more information about Thailand. Nong Khai Map is your online guide to Nong Khai, a busy town in the north-east of Thailand (Issan or Isan). Nong Khai map also provides a popular tourist magazine, detailed maps of the region and community forum. Enjoy your stay in Nong Khai Thailand. Bangkok Post Asia’s number one English language daily. The Nation daily newspaper in English. The best English language source for local Thai politics. Chiang Mai News online is your one stop source of news and information on Chiang Mai. Chiang Mai Trader the classified trading post of Chiang Mai and Bangkok. Bangkok Pundit an informative insiders blog about Thai politics. Asia Times indepth / insightful news on Asia & the world. The Irrawaddy News regional news covering Burma & Southeast Asia. Kachin News news from Kachin State in northern Burma. Shan Herald News Agency news from the Shan in Burma & Thailand. Vientiane Times English language news from & about Laos. Thai Burma Border Consortium working with displaced people from Burma. TBBC is a consortium of 12 international non-governmental organisations (NGOs) from ten countries providing food, shelter and non food items to refugees and displaced people from Burma. TBBC also engages in research on the root causes of displacement and refugee outflows. Programmes are implemented in the field through refugees, community based organisations and local partners.